The last few days have been overcast, if not rainy.. 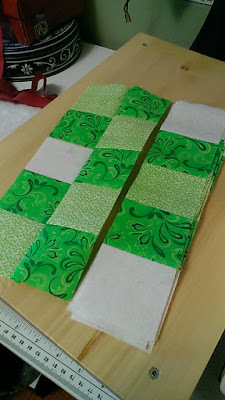 I hadn't planned on doing this until next month, but I decided to cut out a kit for an Irish chain quilt for the St. Anthony's Quilters. They need a quilt to start up in September, and they decided an Irish chain would be a nice change. I cut out the kit for the large lap size quilt. I had been wondering if I'd have enough fabric in my stash. I did. 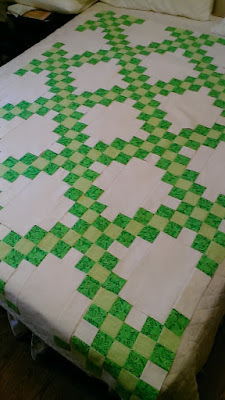 It wasn't long before I had the 18 25-patch blocks done, and the 17 alternate blocks. It's a grayish Saturday today and I laid out the quilt on the spare bed to see what it will look like. I like it. I picked them up using my favorite Eleanor Burns method. What's the Eleanor Burns method for picking up the blocks? :) I stack left to right, top to bottom. I agree with Andrea's question! I was just Googling to see what it is! What will I work on Tomorrow?